In April I had the honour of being chosen to do the Wedding Hair and makeup for the lovely Hayley and her wedding party at the prestigious Down Hall Hotel near Bishop Stortford in Essex. They were one of the funniest and warmest wedding parties i’ve ever worked with. My good friend Kelly came to help with the bridesmaids hair and i did all the makeup and Hayleys Wedding hair. We both just fell in love with these yorkshire ‘lases’. Our sides hurt from laughing when they left us to go and get ready and we felt all warm and fuzzy inside like the buzz you get from a night out with your closest girlfriends. This warmth and love shone through the whole wedding. But not content with the sparkle from their love this bride to be decided to dazzle by having Swarovski Crystals put through her hair (a little squeal just escaped, remembering how much i LOVED this look). A little idea I stole from the Disney Cinderella film. And what girl doesn’t want to be a princess on her big day. I asked Hayley to share her favourite picture and memories from her big day and I know she wont mind me sharing them with you. Thank you girls for the amazing memories!! 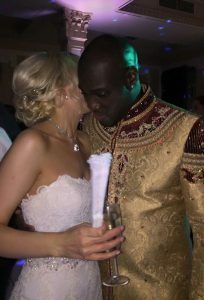 This one is a nice snap from the evening when Gordon changed into his traditional Ghanian outfit! You can see the sparkles in my hair too! My favourite moment was actually at this point in the evening. We had a whole African section in the playlist and all of Gordon’s family got up on the dance floor and made a circle around us and were all singing, it was like having a live choir in the reception – it was just magical – everyone who came to the wedding said the same thing, you could feel the happiness and love in the room, it was a moment I’ll never forget. I loved seeing the room for the first time too, I wanted to create a really romantic feel with the lights and candle light and I was really pleased with how it all came together. You have a vision in your mind of how you want it to look and it was amazing to see it all come to life. There’s so many highlights but everyone just kept saying that it was just a very happy wedding – everyone was smiling all day and it was full of love – but I suppose all weddings bring that out in everyone don’t they!